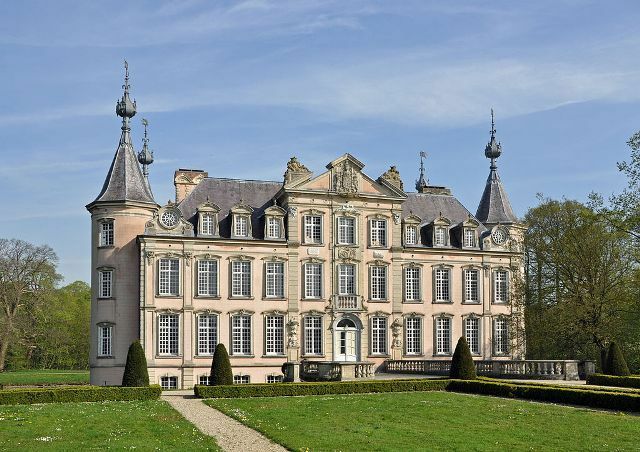 Notes: Poeke Castle (Dutch: Kasteel van Poeke) is a castle near Poeke, a small town in the municipality of Aalter in the Belgian province of East Flanders. The castle, standing in 56 hectares (140 acres) of park, is surrounded by water and is accessible through bridges at the front and rear of the building. Poeke Castle is situated at an elevation of 15 meters. In 1977 the castle and its 56 ha park became the property of the municipality of Aalter, which now uses it for cultural meetings and festivities. It was used as a location for filming interior and exterior scenes for the 2012 BBC/HBO production of Parade's End. Poeke Castle became an official national monument on 13 October 1943. The park was declared a protected landscape in 1978.